The Cupid Mouse is an Event Mouse found during the annual Valentine's Day or Lunar New Year events. Information on how to locate and capture the Cupid Mouse can be found on the current Valentine's Day or Lunar New Year location page. Loot: King's Credit, Valentine Charm, Luck charms, DHU-, DLU+, Bow and Arrow, Valentine themed Skins, Valentine's Scroll Case, area specific items. 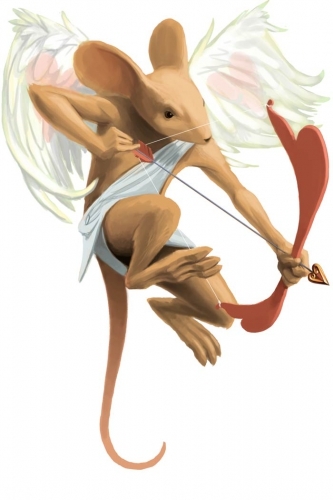 10 February 2009: The Cupid Mouse was released as part of the Valentine's Giveaway event. Prior to 2012, the Cupid Mouse was found to be especially attracted to SUPER|brie+ cheese. 10 February 2014: Prior to the Valentine's population shift, the Cupid Mouse could only be found in the Iceberg and Acolyte Realm phases of Calamity Carl's Cozy Cruise. Love is in the air, and so is this mouse! Firing their heart-tipped arrows, these mice are responsible for a slight increase in the mouse population during February. Hunters who get caught in the crossfire may have second thoughts about using their deadly traps on the little mice. Hey, even zombie mice deserve some love! This mouse is available around Valentine's Day. This page was last edited on 8 February 2016, at 21:41.